After months and months of browsing through catalogues and fussing I finally bought our wedding bands! The purple 'dots' you can see inside are in fact rubies! I chose a very simple design of matte white gold with a shiny stripe. My band is 4 mm wide, Mateusz's band is 5 mm wide as he's got way bigger fingers that mine. I bought them from a Polish jeweller Red Rubin ('rubin' is Polish for 'ruby') and their signature feature is to put a tiny ruby inside each band as a symbol of good luck and prosperity. Also, I've had our names (mine bears the name of my fiance, and fiance's ring bears my name) and the date of our wedding engraved on the inner side. All in all, I'm really happy with them! Also, I had to get myself a pair of wedding shoes because as you know, the dress fitting is impossible without the shoes. I visited dozens of stores, establishing that a) shoes designed specificaly for the wedding are twice or 3 times more expensive than usual shoes for lower quality and cheaper materials, b) the designs were fashionable 10 years ago, c) most of the pairs I tried on were terribly uncomfortable, d) the heels are mostly too high for me to even walk in. Finally, I came round the fact that I won't be able to find my perfect wedding shoes or even if I could find them, I refuse to pay ridiculous prices for something I'll wear once in my life. I decided to get this simple design; it's not the most beautiful shoe in the world, but the color matches with my dress, the heel is right height for me, they're comfortable, and they were very reasonably priced. Actually, they look really nice on my feet as well. 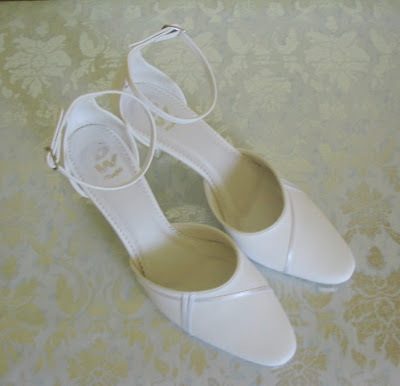 Have you had similar problems finding your wedding shoes or am I just too choosy? Oh I love the shoes. My sister has been looking all over for her wedding shoes as well, so I can imagine it's not easy. Are you excited? 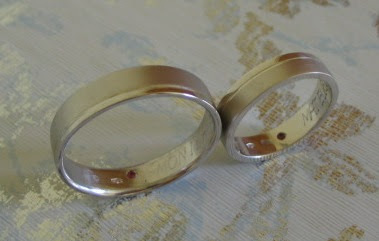 I love the simplicity of the rings and the added touch of the little ruby. I love hearing about cultural customs. I really like the shoes you picked. I has a similar heal on my shoes. I needed something that would give me a bit of height (I'm 5'1) but wouldn't put any unnecessary strain on my back. I also picked up a pair of flats to wear if and when I got tired of my heals. @Natalia: I will defo post some pictures of the pre-wedding styling! I'm having a fitting next week, can't wait! The rings are gorgeous. I love the shiny stripe against the matte it makes them unique.. and the little ruby inside is such a nice idea. Its almost like the ring is 2x good luck. 1x for what it stands for and 1x for the ruby! I like the shoes.. wedding shoes are always hard because all brides want a heel but not to be too tall. 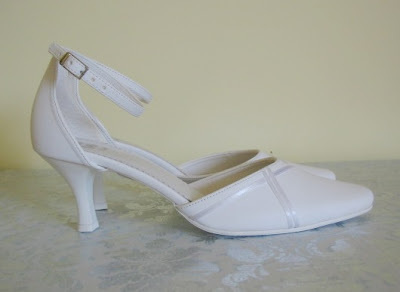 I know what you mean about the heel but i think everyone expects wedding shoes to look like that.